Instead of writing about real ghost stories tonight, I'm going to salute one of my favorite fictional ghost stories. The Devil's Backbone is one Guillermo del Toro most compelling stories. Del Torro's best work is set in Spain. This is a historical movie set during the Spainish civil war. It echoes the beauty of his future films like Pan's Labrynth and The Orphanage. Del Toro knows how to pull at the heart strings and chill the soul with his lovely stories of everything that can be lost and forgotten in the course of life. I should have watched this movie years ago. It is one of the best and most tragic ghost movies. I just saw this movie a month ago. The Devil's Backbone is the story of a young boy orphaned by the Spainish civil war. He is left in a large, broke orphange with ties to the resistance. The boys in the orphanage are starving, despite the best efforts of those who run it. The young hero meets the ghost that haunts the orphange as soon as he enters it. He follows the ghost, but its secrets are kept hidden until the end of the film. The most compelling feature in this film is the way in which Del Toro intertwines the characters' lives and stories turning the most mundane movements into a kind of art. The ghost in this story is a hero as well. It warns the boys of the many horrors ahead. They are the horrors of the world of living and this movie reminds us that what we should fear most isn't what lurks in the shadows of old buildings, but what comes charging at us in broad daylight. Although this movie was given lukewarm reviews, I believe it is a classic ghost tale that brings the dead to life and celebrates the power of life to triumph in the face of death. They are very depressing movies, but they are beautiful. I feel like his movies are like Greek tragedies. The end with catharsis. I love them, even though they often make me cry. didn't realize he'd made several movies--I have "the orphanage" and quite enjoyed it...will have to locate this one...thanks for review! I just saw this a week ago and i really liked it. It is a sad story, but also romantic and gothic. I enjoyed it. I had forgotten about this one. It was a good one, wasn't it? I thought it was so powerful. I love his movies. They have a lot of heart in the storylines. This one WAS especially well done. Great one to write about. Good job! 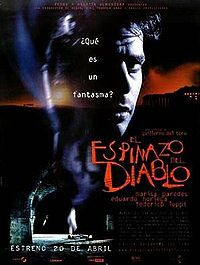 most of del toros movies have a fairy tale feeling to them(except for his main stream offerings..blade 2,hellboy 2 etc. )and if you watch them till the end youll find that these "depressing" movies end not tragically but in a beautiful way..